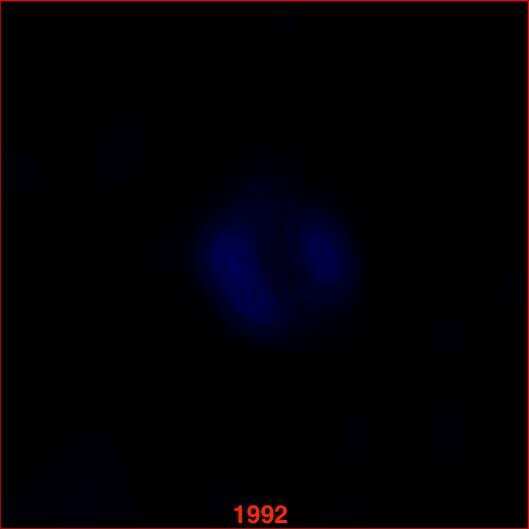 [TORONTO] Since it first appeared in the southern night sky on February 24th 1987, Supernova 1987A has been one of the most studied objects in the history of astronomy. The supernova was the cataclysmic death of a blue supergiant star, some 168,000 light-years from Earth, in the Large Magellanic Cloud, a satellite galaxy of our own Milky Way Galaxy. It was the brightest supernova to appear in our skies since Kepler's Supernova in 1604 and the first since the invention of the telescope. The brilliant new star was first spotted by two astronomers working at the Las Campanas Observatory in northern Chile the night of the 24th: the University of Toronto's Ian Shelton, and a telescope operator at the observatory, Oscar Duhalde. In an accompanying paper, published in the Astrophysical Journal on October 31st, Cendes and her colleagues add to the evidence that the expanding remnant is shaped–not like a ring like those of Saturn's–but like a donut, a form known as a torus. Cendes' co-authors include Dunlap Institute Director Prof. Bryan Gaensler and Dunlap postdoctoral fellow Cherry Ng. The time-lapse was created from radio observations made with the CSIRO Australia Compact Telescope Array at the Paul Wild Observatory, New South Wales, Australia.